Have Fun Sticking to Your New Year's Resolution!!!! WiFi scales are here. For all of us true techie personalities this is an exciting thing. Keeping our resolutions of losing weight and improving our health has gotten easier. Why use pen and paper to track your weight and body fat when it can be done for you each time you step onto the scales. The Withings WiFi Body Scale sends data via WiFi to a website (private with password required) and to an iPhone. Electronic scales are nothing new. I have a scale that measures both my weight and my body fat content. As I lose weight my body fat figure goes down as well. Sometimes I wonder how accurate the fat content is - but what I find is that they are very consistent. I have had my fat content measured with the underwater method in the past and I must say that my scales measure pretty close. These scales have been my favorite for a few years now but I can see that their days may be numbered since I discovered the Withings WiFi scales. What will the Withings Scale do for you? The Withings WiFi scale measures and records your weight, body fat and BMI (body mass index). You can see the digital readout on the scale and you can see the same readings on the web. It is so much better than an ordinary notebook. Digital graphs and weight markers are easy to read and easy to follow long term. Information can be kept private or it can be shared with anyone you choose via email, twitter or website. Staying accountable to others increase the motivation to stay on track. If your friends have a Withings scale too you could have a contest – which one can lose the most weight within a given time. I jog with a Garmin 305 Forerunner watch. My motivation is greater with the expectation of seeing my results show up on my computer. Tracking my progress is easier and it is fun to see the comparisons day to day as well as month to month. Can the Withings Scale be shared? Multiple people can use this scale. The scale can tell the difference between users and most likely can tell who is stepping onto it. If two people are too close to the same weight and body make-up it will ask for further clarification. What should you expect as you open the Box? 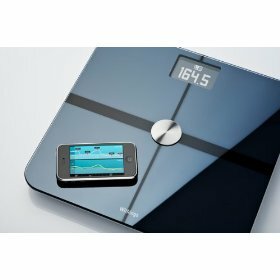 The Withings WiFi scales is very modern looking. According to their makers the top of the scale is a slab of tempered glass along with some kind of metal. Yes – fingerprints do show. Actually the design of this scale reminds me of my iPhone. This scale weighs in increments of 0.2 pounds. It displays pounds, kilograms or the British Stone. The readout is located within a 2.4 inch by 1.6 inch display. The overall scale is black and the readout reads white on black. The good looks and the cool technology is not cheap. Typically the Withings scale will cost approximately one hundred and sixty nine (169.00) dollars. The cost can be justified somewhat by the length of time you will own them. I have owned my present electronic scale for at least six years. Will the WiFi Scales work in your Home? The Withings WiFi Scale should work in most any home. One concern you may have is how far away your scale is located from your wireless router. If you do not get a good connection you may need to move the scales closer to the router.